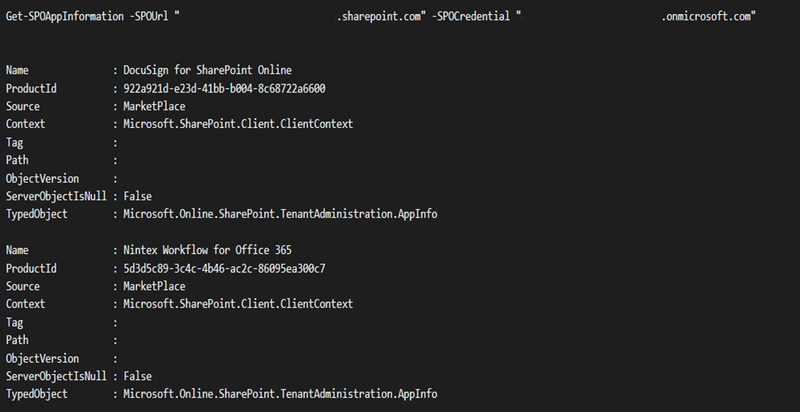 During SharePoint Online discussion a question popped up “How to get all installed application information in SharePoint Online?” a simple answer is Get-SPOAppInfo cmdlet! But, wait we are partially correct but read this documentation https://technet.microsoft.com/en-us/library/fp161398.aspx. The below image illustrates the parameters of Get-SPOAppInfo both set to be false and it’s not $TRUE – This cmdlet needs either Name or Product ID! So, we can’t use this cmdlet to retrieve all the apps installed in the given Tenant! Enough! We are not going to use this. Let’s use Client Side Object Model in PowerShell and solve the issue. Get-SPOAppInformation -SPOUrl "https://contoso-admin.sharepoint.com" -SPOCredential "TenantAdmin@contoso.onmicrosoft.com"
Bit more to organize it, we can use PSObject!